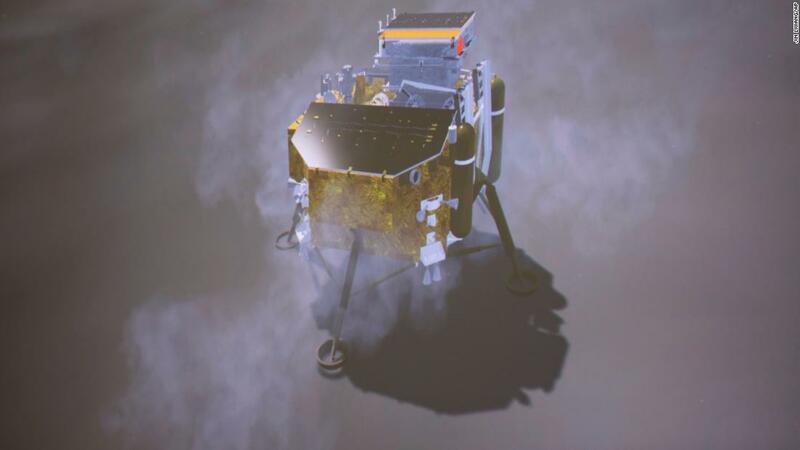 Named after the pet rabbit belonging to the mythical Chinese lunar goddess Chang’e, the Yutu 2 rover is making history as it sends back images and other data from the far side of the moon. The rover touched down Thursday, delivered to the moon by the Chang’e 4 probe, a historical first for humankind — the far side of the moon has not previously been visited — and a major achievement for China’s increasingly impressive space program. Thursday’s landing is the first time humanity has landed anything on Earth’s natural satellite since 2013. Its success “opened a new chapter in humanity’s exploration of the moon,” China’s National Space Administration said in a statement. The front page of Friday’s China Daily, a state-run newspaper, featured a large photo of scientists at the Beijing Aerospace Control Center reacting to the touchdown, alongside one of the first images sent back by Chang’e 4 of the moon’s far side. China was late to the space race — it didn’t send its first satellite into orbit until 1970, by which time the US had already landed an astronaut on the moon — but it has been catching up fast. While the reaction to Thursday’s landing in China — where economic concerns are becoming increasingly pressing amid an ongoing trade war with the US — was more limited than for the previous lunar mission, the success of Chang’e 4, and the global acclaim it has brought, will be a significant boost to the Chinese space program. “The Chinese people will take bigger strides to explore further into the space,” he added. The first stage of China’s space dream largely takes place in our planetary neighborhood. In 2020, the next lunar mission, Chang’e 5, is due to land on the moon, collect samples and return to Earth, while preliminary plans are underway for a manned lunar mission in the 2030s. If successful, China would become only the second country, after the US, to put a citizen on the moon. “Our overall goal is that, by around 2030, China will be among the major space powers of the world,” Wu Yanhua, deputy chief of the National Space Administration, said in 2016. As Chang’e 4 was preparing to descend to the lunar surface, NASA sent back photos of Ultima Thule, the first ever flyby of an object in the Kuiper Belt, a collection of asteroids and dwarf planets a billion miles beyond Pluto. There is a very good reason for this. Robots are cheaper and longer lasting, and can carry out the same observations and experiments as a human astronaut. Most importantly, they don’t die — no one wants to be the first country to leave a corpse on the moon. This isn’t to say the manned lunar missions were useless — they provided key information on how humans can survive in space, as well as potential dangers and challenges, which helped lead to significant scientific advancements. “Hmmm, our astronauts speak English,” Bridenstine wrote on Twitter. China is also pushing its rivals in other ways. In 2016, it completed work on the world’s largest telescope, which will work to detect radio signals — and potentially signs of life — from distant planets. China’s space program is about more than just bragging rights for Beijing. The moon plays host to a wealth of mineral resources, including rare earth metals (REM) used in smartphones and other modern electronics. China already dominates the global supply of REM, and exclusive access to the moon’s supply could provide huge economic advantages. “Each year three space shuttle missions could bring enough fuel for all human beings across the world,” he told state media in 2006.